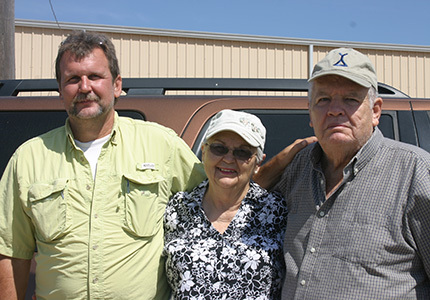 Pictured l. to r.: Pete Jr., Marilyn and Pete Sr. Nieschwietz. owned and operated by the Nieschwietz Family. Our roots in the Simmental/Simbrah breeds trace back to 1977, when dad purchased Simmie heifers for us to show and then in 1978 we added some Simbrah heifers. Mom and dad continued buying heifers for all five kids and one grandson to show and along the way we built a herd. We realized early on that Simbrah cattle excelled in South Texas and the Rio Grande Valley, as we have locations in Falls City and Donna, Texas, where were are also involved in produce farming. 7N Ranch feels youth is important to the success of the breed and we support the youth programs of Karnes County and the Valley, as well as the Simmental and Simbrah breeds. In the past few years, we have really stepped up our program by selecting females that carry some of the most proven lines in the breed and our bull power consists of NF Smith Simply Great, Smith Smooth Operator, LMC Gumbo, and LMC WFC Wave Amigo. 7N Ranch is located in both Falls City and Donna, Texas.